Memorial Day. A holiday in the United States to honor those who died while serving in the armed services. Before I launch into the main topic of this blog let me say thank you to all those and their families who made the ultimate sacrifice in the name of our country. I hope it was a justified and last resort decision by our government to put you in harms way. There is certainly room for both perspectives on a long three-day weekend. We can simultaneously pay tribute to those who have passed during dark times while enjoying the brightness and warmth of the sun in the present. Around the Golden K there’s other reasons for gratitude and remembrance. Events that have greatly shaped this latest phase of mine and Holly’s life. 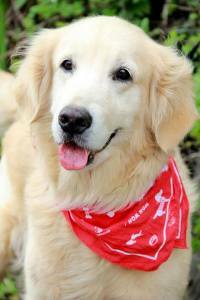 It was three years ago this Memorial weekend that Golden Kali’s foster care givers drove her and 22 other rescued Golden Retrievers to the airport in Taiwan. The care givers stayed with the Goldens cooing and petting while waiting in the terminal until the last possible moment before placing them in a travel crates for the 12 hour flight to SFO. Meanwhile, Holly and I and our daughter were driving from Livermore to SFO in great anticipation of meeting Kali and welcoming her into our family. The plane landed and eventually the 23 Golden Beauties were wheeled in their travel crates into the terminal and united with their new families for a second and well deserved chance at forever happiness. It was just one year ago this Memorial weekend that Holly and I closed the door behind us in Livermore and drove away to our new home in the mountains. After 23 years of raising three kids in Livermore we sold our home, packed up our belongings and drove away. But not before taking one last walk around the empty house, mostly in silence, remembering both the good and challenging times with a melancholy fitting for a major life changing event. As we walked out we paused and hugged, choked back a few tears, closed the door, and drove away. When we drove away Kali – our Golden Treasure – was there by our side as she had been for the past two years. But now there was also Kloe. Kloe – the ten week old precious puppy we adopted just a week before the big move. Some would call it crazy to adopt a puppy before making a major life change. But thats how we roll and we considered ourselves blessed to have this little girl at Kali’s side as we drove into the future. Our home in the mountains is called The Golden K. A year ago we were mesmerized to be living in the middle of the Stanislaus forest under pines, oaks, and cedars. A year later the magic remains. Except this year the boxes are unpacked and we sit and relax on the patio looking up at the pines, cedars, and oaks reflecting on a year of great change and good fortune. I look down at my feet and see my rock, my girl, my Golden Kali who’s been by my side every day all day for the past three years. Next to Kali is Kloe who a year ago was 15 pounds and now weighs in at 80. Still very much a puppy and so very much a part of the fabric of our lives. So it’s It’s Memorial Weekend 2017 and we are so blessed here. Here at The Golden K with our two girls and a romantic perspective of life at 3100 feet. Today is the three anniversary of when Kali arrived from Taiwan and rescued me. This is a re-post from two years ago after our first 365 days together.. Happy Anniversary Kali – I can’t remember or even imagine life without you! As some followers of Golden Kali know I have another blog called The Golden K. The Golden Kali blog began the day after Kali arrived from Taiwan and joined our pack. The Golden K blog started shortly after relocating to the mountains a year ago. So I now succumb to the obvious and will merge the two blogs because they are really the same. I hope regular followers of Golden Kali will enjoy an occasional post about The Golden K located in the Sierra Nevada Gold Country town called Tuolumne. And I hope followers of The Golden K will get to know Kali and Kloe, the inspiration for the Golden K.
Followers of Golden Kali can read the first post from a year ago for more context about The Golden K here: https://goldenk.net/2016/06/22/the-golden-k-begins-now/. From Wikipedia (the source of all knowledge, truth, wisdom. And all for free). OK , I added the blababdy blah part but whatever…. The article began to catch my interest and as I read further I saw that J.M. E. McTaggart’s 1908 The Unreality of Time argues that, since every event has the characteristic of being both present and not present (i.e., future or past), that time is a self-contradictory idea. Apparently old J.M.E. was a deep thinker and something called an Idealist Metaphysician. Cool title but how much could that job pay, right?? “But wait Mike”, you might say. “I follow this blog to read about Golden Kali, and her little sister Kloe, and to see all those cute pictures of their antics and sweetness. If I want to read science and hear fact-based philosophical arguments I’ll get that info like everyone else does by turning to social media and reviewing the seemingly endless stream of memes that monopolizes my feed”. OK, fair point. So on to the real purpose of this post. One year ago today we brought a nine-week 15 pound puppy home that we named Kloe. Kloe doesn’t give a woof about time except if it’s time to eat, or time to walk, or time to play, or time to cuddle. Those are concepts of time Kloe can relate to. Kloe time. But, in “the continued progress of existence and events” it is has been a year, and now at one year and nine-weeks old, Kloe is still very much the same exactly the same pup she was one year ago. Except now she is 65 pounds heavier and a few feet longer. Yep – it was in my Facebook feed: “One Year Ago – see your memories”. And there were two pictures of Kloe the day she came home. I smiled, paused for a few moments to reflect, and then scrolled down through the endless stream of memes looking for fake news. Thank you Facebook for bringing a very special piece of the time continuum to my news feed. Thank you Kloe for all the licks, laughs, and love during the past year.